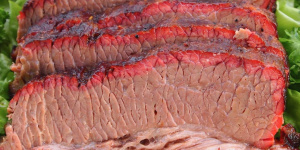 Absolutely obsessed with perfect brisket texture - The BBQ BRETHREN FORUMS. I inject with something containing phosphates the night before. I cook mostly HnF 300-350, about 3-4 hours unwrapped and then wrapped in foil until probe tender. I let the IT go down a bit and then rest in a Cambro until turn in. I cook the best briskets I can find, which isn't much since we don't really get the good stuff at all. There's something about the "perfect" texture that is elusive, I can't put my finger on it but 9 out of 10 times the texture is off even though the brisket feels tender when probing it. It's missing that spider-web look and doesn't have any gaps. It is tender, pulls apart nice, but rather pulls apart in chunks between the muscle fibers and is unpleasent to eat. I would describe it as "splintery" and dry and when chewing it does't seem to go down ever. You can pretty much see what I mean in this video, even though the description says "perfect texture"
But 1 time out of 10 it comes out just right. Has that spider-web look, has some gaps, is really moist and just perfect. But it probes exactly the same as the previous example with bad texture. If not, I would put my bet on overcooked. Could it be that there just isn't enough marbling on those splintery briskets? I think it's mostly due to the brisket just being dry, but I'm sure there is also something else going on. Those are two mighty fine looking briskets. Any pictures of the ones you consider to be "splintery"? might help to see them. I cooked on Sunday that I didn't think it had enough marbling in the flat and it ended up surprisingly well. Are you including any liquid when wrapping? What are you cooking on? Flat or packer? When you wrap, are you adding anything to help with the moisture? What is the IT when you wrap? How much fat do you leave on? Probing more than one spot? IT when probe tender? I know it's feel but IT with the feel helps. So many variables I want to ask about. A few more details about your process may help us, help you. I am assuming you are cutting against the grain... Sounds basic, but that could contribute to the issue. Have you tried a lower temp cook? Maybe 250-300 range instead of 300-350. I like an average cooking temp of 275 and wrap when IT (internal temp) is 160-170. Your pictures look good to me. Have you tried wet aging the briskets? Leave them in the cryovac in your fridge for 3-4 weeks to help tenderize the meat. If you aren't able to get prime or wagyu this is worth a try to see if it helps your tenderness/texture. It needs to be removed from Cambro and set out on the counter for a while(150*) before slicing.